Schuster Institute Senior Fellow Brooke Kroeger's book "Undercover Reporting" is paired with a unique database of archival and contemporary examples of undercover investigations. We live in an age when most news media organizations and journalists espouse full transparency in reporting. Many journalism organizations today either ban or strongly discourage reporters from working undercover, although some journalists such as Schuster Institute Senior Fellow Tracie McMillan do so because they believe it's the only way to document a story of strong public interest. And there are some, like Brooke Kroeger, Schuster Institute Senior Fellow, New York University professor, and author of the 2012 "Undercover Reporting: The Truth About Deception,"who argue for a reconsideration of the oft-maligned journalistic practices such as undercover reporting. While it may seem paradoxical, Kroeger concluded that much of the valuable journalism in the past 150 years has emerged from undercover investigations or those that employ various forms of subterfuge and deception to expose wrongdoing. Kroeger asserts that undercover work embodies a central discipline of good reporting—the ability to extract significant information or to create indelible, real-time descriptions of hard-to-penetrate institutions or social situations that deserve the public’s attention. 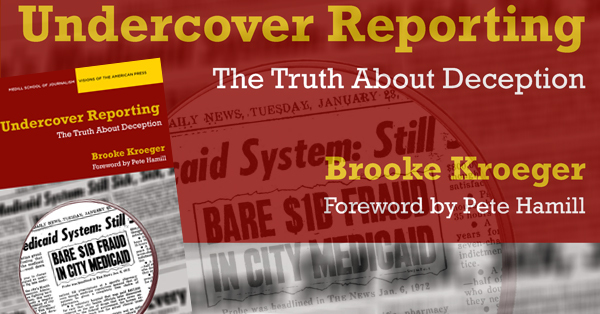 Kroeger published a companion website for the book "Undercover Reporting." In collaboration with the New York University's Division of Libraries, she created a unique online database of groundbreaking stories journalists produced while reporting undercover. The database, which dates from 1830 to the present, reveals archival coverage of slavery and other important topics that likely could only have been fully reported from the vantage point of an undercover journalist. NYU Digital Library Technology Services designed the software to assemble the stories and navigate the database and describes it as "a resource for scholars, researchers, and journalists that provides links or reproductions of both recent and long-buried journalistic investigations in all media, going back nearly two hundred years. The database is searchable by keyword, media outlet, date, or author, or can be browsed by series." In print and by podcast, Kroeger has tried to restore “honor and legitimacy to the discomfiting techniques of undercover reporting.” Following are articles and a podcast interview where she explains more about her work. Reviews and Press Coverage of "undercoverreporting.org"
Kroeger’s August 2012 launch of the unique online database drew press attention to the topic of undercover reporting and the value of the database resource to journalists and the public at large. These are a few responses from the of media. Others may be found on the book’s website. Radio National (Australia) Media Report: "History of Undercover Reporting" ". . . Brooke has written a history of the genre and has assembled a database of (mainly American) undercover journalism. But two of her earliest examples are Australian. . . . "
10,000 Words/Media Bistro: "New Database Tracks History of Undercover Reporting" "Definitely bookmark worthy." International Journalists' Network: "Finding Hidden Gems in the Undercover Reporting Database" " . . . a vital history of muckraking in the US. . . . "
Richard Prince's Journal-isms: "Journalists of Color Part of 'Undercover' Database" "Kroeger provided Journal-isms with this sampling of material in the project by or about people of color..."
Daily Kos: Readers and Books Lovers - Undercover Reporting: The Truth About Deception ". . . Kroeger argues for a reconsideration of the place of oft-maligned journalistic practices." Brooke Kroeger is a journalist, author of four books, and professor of journalism at the New York University’s Arthur L. Carter Journalism Institute. In 2012, she joined the Schuster Institute for Investigative Journalism as a senior fellow.